June's 1st weekend we drove to Albany, NY to attend a birthday party of our closest friend's daughter. For the party I made this salad which everyone appreciated and enjoyed eating as much as I loved making it all the while hoping it to turn out well. You won't imagine people loved it and few of them took a second serving too! I was so overwhelmed with the kind of response and appreciation I got for the salad, thought of sharing it with all my readers too. Also many asked for the recipe there, I have a similar salad recipe but the dressing is a little bit different so thought of posting it on my website. Salads are a healthy way to eat good and nutritious food. 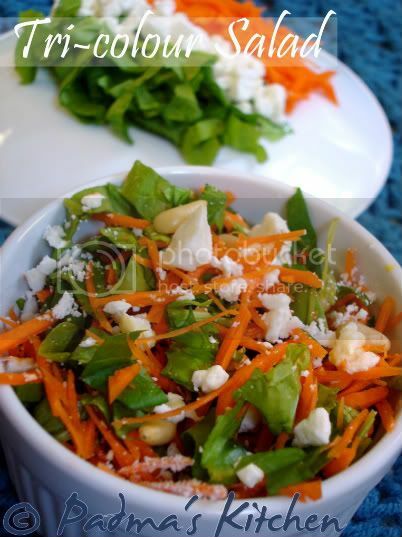 And for a basic salad recipe what I do is just peep into my refrigerator and pantry for necessary ingredients like salad greens, dried fruits, any kind of nuts and lastly some acidic ingredient like vinegar or citrus juice, that's pretty much it. I start making delicious salads by combining friendly veggies that go well with each other and the flavors kind of marry with each other quiet well. I try many dressings doing my own version, sometimes, I like it, sometimes they take a ride into my kitchen sink. Coming to this dressing, it is simple homemade vinaigrette with vinegar, extra virgin olive oil, honey and Dijon mustard with little seasoning. 1. Mix all the salad ingredients except nuts and croutons in a large bowl. 2. Prepare the dressing by first adding dijon mustard in vinegar juice whisk well. 3. Add freshly ground black pepper, salt, honey mix well. 4. Whisk vigorously while adding extra-virgin olive oil. 5. Spread over the salad, mix and cover it with plastic wrap and keep refrigerated. 6. When ready to eat top it with toasted almonds and croutons. Tip: For crunchy salad, wash the greens and use a salad spinner to remove excess water out of the leaves or you can dab excess water in the leaves with a kitchen towel. 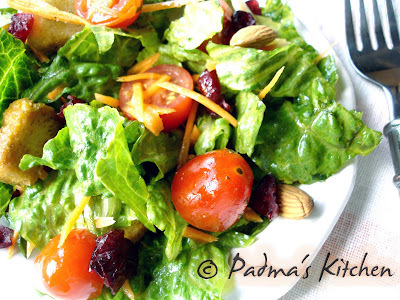 Very refreshing and colourful salad..
Hi Padma, good to see you back. I didn't realise you'd had a child, congrats and best of luck. That salad looks so refreshing. YUM! Good to see you back Padma, salad looks great! salad looks too good.. croutons, nuts would make it so crunchy! Awesome and inviting salad. Looks very colorful. That salad is awesome, I love the dressing!